If you’re thinking about adding a Beagle to your family, you are probably wondering what common health problems affect this breed. It’s always better to be more prepared and know if you will be able to handle any adverse health outcomes should they arise. Below are some health conditions that may affect your pup. It is important to remember that Beagles are relatively healthy dogs so more likely than not your pup will be perfectly healthy. Dwarfism can occur in Beagles as a genetic disorder. The specific type of dwarfism that is common in Beagles is called Beagle dwarfism or chondrodystrophy. This genetic disorder causes poor development of cartilage. In Beagles, dwarfism presents itself as a dog having short legs in addition to the intervertebral discs in their spines being prematurely degenerate. As dwarfism is a genetic disorder, it is very important to know the health of the parents before getting your Beagle because symptoms do not always present themselves as soon as your dog is born. In the case of dwarfism, it may take up to a year to notice the symptoms. Dwarfism, or rather the chondrodystrophy, can also cause Intervertebral Disc Disease (IVDD) in dogs. IVDD displays itself in adult chondrodystrophic Beagles. IVDD symptoms range from mild pain to paralysis. Most dogs experience symptoms in between this range. It may take a few years to notice your dog is suffering from IVDD because you have to wait to see symptoms of pain and difficulty walking and lifting their heads. More specific symptoms are neck pain/stiffness, back pain/stiffness, yelping in pain, impaired urination, reluctance to rise, lack of coordination, abnormal reflexes, dragging of one leg or more, and paralysis in one or more limbs. Some Beagles may have chondrodystrophy and IVDD and live a relatively normal life. However, some may live with quite a bit of pain and canine arthritis. Dogs have three eyelids, and when the gland of the third eyelid slips out of place, or prolapses, the resulting condition is cherry eye in dogs. It is so named because of a red/pick sack that is visible in the corner of the dog’s eye. When the gland prolapses, it usually swells and becomes red. This gland’s purpose is to help produce tears. You will very clearly see the pink/red mass in the corner of your dog’s eye. Your dog will also likely paw their eye, even though it isn’t necessarily painful. Your dog will start to have some discomfort in his eye because the gland is not able to produce tears as readily as it should. With inadequate lubrication of the eye, it can also lead to dog eye infections. The cause of cherry eye is not entirely known, but it is probably due to weak connective tissue in the eye. When this occurs, contact your vet, as they can surgically reposition the gland in the correct space. Glaucoma is a common eye problem that affects Beagles when there is too much pressure on the inner eye. If left untreated, it can lead to canine blindness. The pressure is caused by a stretching of the eye due to extra liquid called aqueous humor. When this naturally occurring liquid builds up and cannot drain out of the eye, it creates quite a bit of pressure. Symptoms of glaucoma in Beagles are pupils of different sizes, the appearance of vessels in the white of the eye, tearing, squinting, cloudy cornea, and a bulging/swollen eye. Canine Glaucoma can be treated with medication such as eye drops or in severe cases can be treated with surgery. Another eye issue that Beagles can develop is called distichiasis. It is characterized by an abnormal growth of the eyelashes where the eyelashes bend and grow from an abnormal spot in the eyelid. This will cause irritation in your dog’s cornea, and you will likely see him pawing at his eye. To treat this, your veterinarian will likely cut the eyelashes of concern so that they no longer bother your dog’s eye. Trimming of your dog’s lashes will have to be quite often. There are also surgical options in severe cases. Chinese Beagle Syndrome is also known as Musladin Lueke Syndrome (MLS) and is characterized by short, upright front toes, where a Beagle looks like they are walking like a ballerina. If your Beagle suffers from CBS he will also have tighter skin and less scruffy looking more muscular. A Beagle with CBS has a flat head, ear folds, and slanted eyes. This syndrome can be diagnosed within the first month of the Beagle’s life. The condition will progressively worsen until your Beagle is around 1 years old. There is no cure for this syndrome, and it is inherited through a recessive gene. Just like humans, dogs can get either Type 1 or Type 2 Diabetes. Both types of canine diabetes have to do with insulin production in the pancreas. In Type 1, a dog has a genetic condition where their body is not able to produce enough insulin. In Type 2, the diabetes is acquired over time and their bodies produce sufficient amounts of insulin. However, the insulin is not working the way that it should. The result is that there is too much sugar in the bloodstream. Symptoms of diabetes are excessive thirst, a change in appetite, lethargy, and increased urination. Fortunately, canine diabetes can be managed with insulin injections. Diet and exercise will also play a large role in controlling diabetes in your dog. But, you as the owner will have to administer insulin injections on a daily basis. Beagles are more prone to Type 1 diabetes, which is genetic. However, Beagles can be prone to overeating because they do not have self-control when it comes to food. If a Beagle does become overweight and remains unhealthy for a large period of time, they may develop diabetes. Because Beagles have long, floppy ears, air can get trapped inside of the ear. When the air, debris, moisture, or even a parasite gets trapped and cannot escape, the result is an ear infection. A common symptom of an ear infection in dogs is constant head shaking. Also, there will probably be a bad odor coming from the ear. When caught early on, treatment from a vet can help alleviate discomfort for your dog and his infection. Epilepsy is a chronic neurological disorder that causes sudden, uncontrollable seizures in dogs. There are partial (focal) seizures and generalized (grand mal) seizures. Grand mal seizures affect both sides of the brain and the entire body. Your dog’s limbs will be twitching and jerking, and your dog will likely lose consciousness. Focal seizures only affect a small part of the brain, and it is possible that only one limb will twitch and jerk. Epilepsy in dogs can be caused by genetics which is the most common occurrence of epilepsy in Beagles. It is suggested to not allow your dog to swim for risk of a sudden seizure and potential drowning. If left untreated, epilepsy may cause permanent damage to your Beagle’s brain and body and in severe cases can lead to death. Hip dysplasia in dogs is a genetic condition and results in arthritis. Most Beagles with this condition are born normally, but over time, the soft tissue around their hips will develop abnormally. This condition may be in one hip or both hips. Your dog will have trouble walking and will run with an altered gait, like a bunny-hop. The reason why this condition is of concern is that it can cause arthritis in the joints and even potential loss of joint function. Your dog will be in quite a bit of pain with arthritis in his hips. Canine obesity can worsen hip dysplasia because the extra weight can cause extra friction on the joint, causing more pain. Even though hip dysplasia is an inherited disease, having proper diet and nutrition at a young age can help to slow down and lessen the symptoms of hip dysplasia in Beagles. Hypothyroidism in dogs is caused by an autoimmune disorder. Your dog’s body believes that there is something harmful in his thyroid and will try to attack himself to solve the “problem.” Your dog’s body will try to replace hormones in his thyroid with fats, called Thyroid Gland Atrophy. Some veterinarians believe that this condition is a result of inbreeding. Fortunately, hypothyroidism can be managed and your dog can live a happy and long life. Although these are not the typically thought of health concerns for most dogs, they are something to keep in mind. Beagles love following scent trails because they are scent hounds. If left off the leash, they will be quite determined following a scent and could go off in the woods for hours. But, while your pup is chasing through the woods, he may pick up poison ivy, ticks, and fleas. Giving your dog a bath after he has run off into the woods is important in case he has picked up poison ivy. Also, during this bath time, you could use it to check your Beagle for ticks. You should make it a rule of thumb to check for ticks every time you bring your Beagle inside if he has been going through a tick-filled area. Mant deer ticks carry Lyme Disease, which causes lethargy, joint pain, and in severe cases issues in the brain. 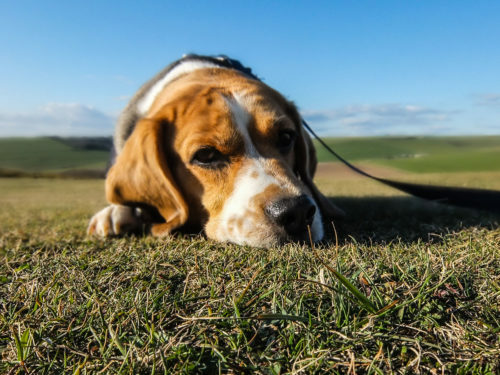 Some of the best ways to reduce health risks in your Beagle is through proper nutrition, exercise, and regular trips to your dog’s veterinarian. In particular, ensuring that your Beagle has proper nutrition is vital. Beagles are prone to overeating because they love to eat. Making sure your dog is eating a balanced diet through proper choice in his kibble is very important. Additionally, it is important to not overfeed through treats. This can be hard because you want to reward your sweet pup, but remember, affection and playtime can be just as much of a reward as treats.